Preheat the oven to 350 degrees. Grease a large bread pan with cooking spray. In a large bowl add the olive oil, yogurt, 2 tbsp of juice from the orange, and sugar. Mix to combine. Crack and add each egg one by one stirring in after each. In a separate medium bowl combine the remaining dry ingredients: Flour, baking soda, baking powder. Slowly add the dry mixture to the wet mixture, stirring and folding them in as you go. Mix in the grated zucchini, 2 Tbsp orange zest and 1 tsp of vanilla extract. Once those ingredients are folded in you can pour the mixture into the bread pan. Bake for 70 minutes or until a toothpick comes out clean. Let zucchini bread fully cool (About 1 hour). After the bread is fully cooled, mix together the powdered sugar and remaining orange juice to form a glaze. Remove the bread from the pan and place on parchment paper. Pour the glaze onto the top of the bread and sprinkle remaining zest on top. Today’s recipe is really a solution to a “problem” for all your backyard gardeners. It’s the time of year where you are starting to grow weary of the dozens of zucchini’s sprouting up in your gardens. Some of you will give them away to friends/family/coworkers. Others will be searching of innovative recipes that aren’t the “same old” that they’ve been eating for weeks now. Me personally, well without a garden of my own, I’m one of the lucky recipients of overflowing zucchini. 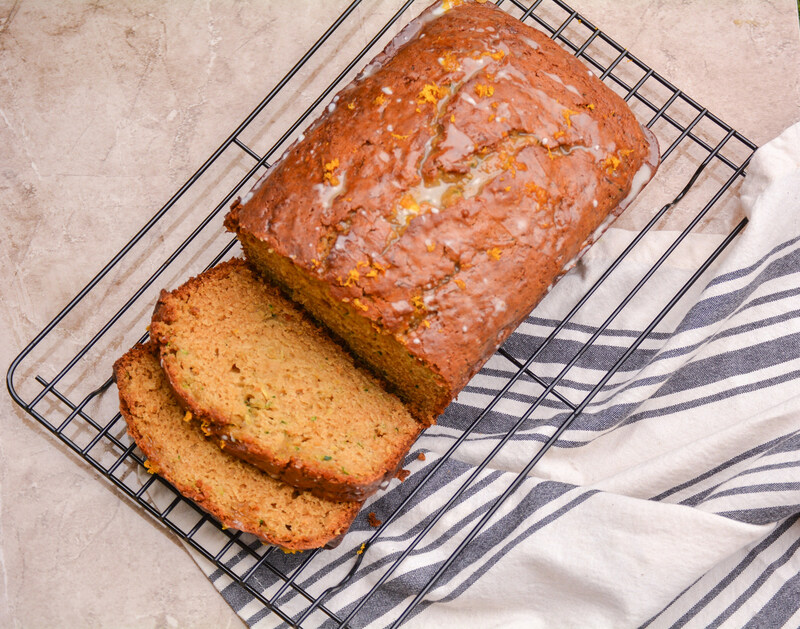 So, I’ve taken the liberty of creating a delicious twist on zucchini bread (Orange Olive Oil) to re-invigorate the zucchini season excitement! 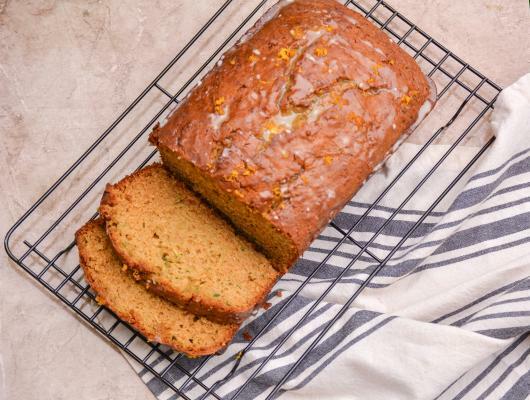 I recently stumbled onto A Latte Food Blog and their Lemon Zucchini Bread recipe. It’s a great idea and something different (Which is what you all are looking for!). While, I’m not a huge lemon sweets fan, it sparked the idea to swap the citrus for an adapted version. When we went to Portland, Oregon in June one of my favorite bites was the orange olive oil donut from Blue Star Donuts (read about here). I knew that flavor combination was a killer one. If done right, I knew it would make an AWESOME zucchini bread variation. After playing around with the lemon bread recipe, I was able to transform the cake into rich, dense, orange scented zucchini bread. The cherry on top is the orange zest glaze that crusts the top layer of the zucchini bread. I brought it to the queen of sweets, my Mom to taste test (and a few coworkers). I’m thinking the “OMG! This zucchini bread is awesome!” means it’s good enough to share with all of you!